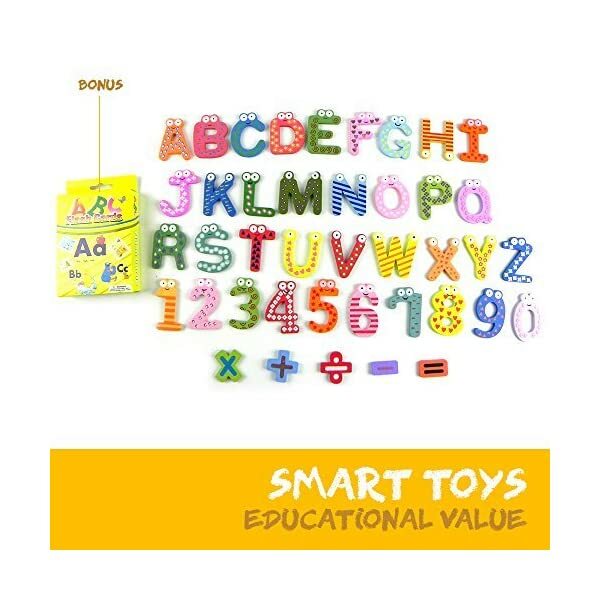 — Smart Toys with Educational Value — Let your kids play and learn in the same time! Joy Abc’s(TM) is decorated with colourful dots, stripes, and other patterns to make learning more fun. — Full Magnet on the Back — Comes with full magnet on the back to stick on fridge or any metal surface so it will hold the letter firmly in position. No more annoying slip & slide letters! 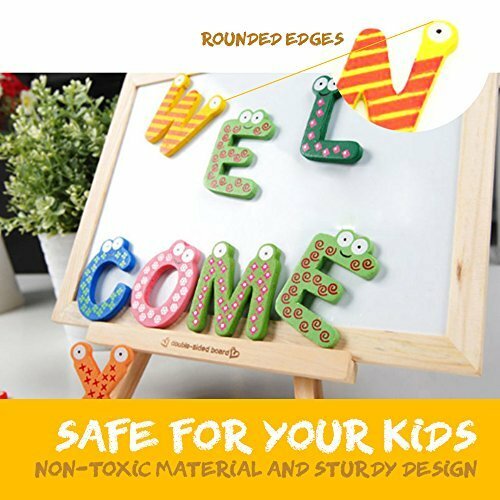 — Safe For Your Kids — The non-toxic wooden material & sturdy design make it super durable and safe for your kid and toddler, since they always tend to fit anything in their mouth. Is it possible for kids under 2 years old to recognize letters and numbers? Educate your kids with a great, incredible balance of fun and interaction that will provide them a memorable learning experience! Make sure, however, that you pick the best so that they can be smart, creative, and literate in no time! Why choose our magnetic alphabet? Our alphabet letters set includes 26 alphabets, 10 numbers (0-9), 5 marks (+, -, x, ÷, =), and a clear tote bag. It helps to strengthen fine motor and coordination, early literacy, matching and sorting skills. With colorful dots, stripes, and patterns, they are not only attractive but also make incredible, worthy gift material! Designed with rounded edges, they enable easier grip by little fingers. The wood is highly sturdy with strong magnets that will stick strongly on fridge surface and magnetic letter board. Made of non-toxic wooden material with a size that is not too small for your kids’ mouths, it will ensure that they do not get choked by them! So what are you waiting for? Give our letter magnets for toddlers and kids’ educational purpose. 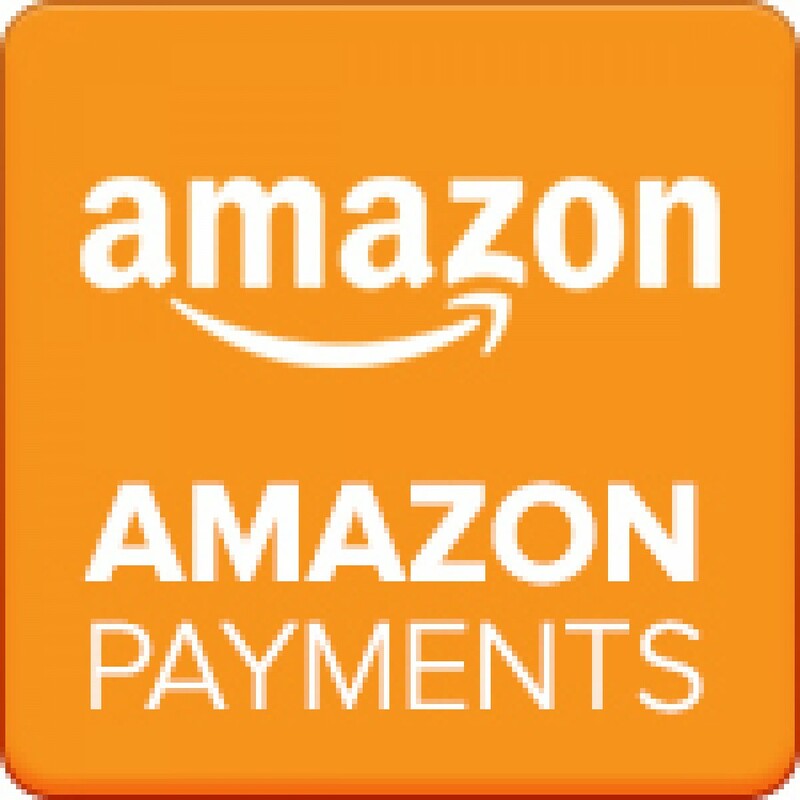 If you want good quality and authentic Joy’s Abc’s (TM) product, make sure you buy those ONLY From TODAY’S DEALS and Fulfilled By Amazon. Others are only selling our Copied Products! LEARNING ALPHABET IN A FUN WAY – Nothing’s impossible to make your 2 years old kid recognizes letters and numbers. Consisting of 26 alphabets, 10 numbers (0-9), and 5 marks (+, -, x, ÷, =), these alphabet magnets help your kids with letter recognition, spelling, early vocabulary and creativity that can strengthen their early literacy, also matching and sorting skills. STRONG AND FULL MAGNETS AT THE BACK – With full magnet covers at the back, no need to worry that it might be swallowed by your naughty, highly curious kids. 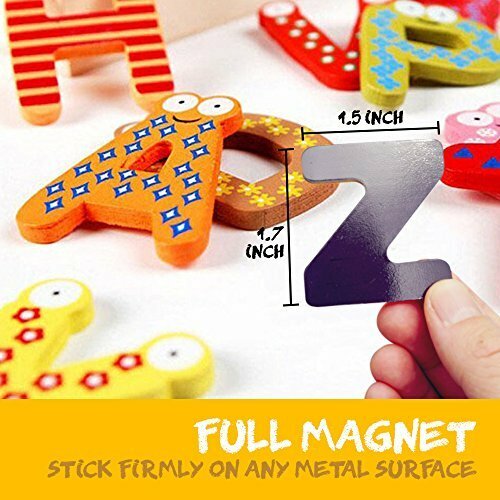 The magnet is smoothly attached as if it is the actual back of the wood letter and sticks strongly on fridge surfaces or magnetic board. The size is large enough that you don’t need to worry about choking. LITTLE “EYES” FOR CORRECT POSITIONING – What makes us different is we provide those cute little eyes to help your child recognize which upright position the letters need to go. Check our review and see what our satisfied customers said about our magnetic letters! PERFECTLY AND STURDILY DESIGNED – The abc magnets are designed with rounded edges, enabling easier grip by little fingers. With colorful dots, stripes, and patterns, they are fun and engaging, making sure that your kids do not get bored. They also make incredible, worthy gift material! FREE EBOOK FOR MOM IS ON THE WAY TO YOUR EMAIL! – Coming with a clear tote bag for you, our magnet letters are the one to look for in the market! So what are you waiting for? You’ll also get a FREE ebook that will be sent to your email with every purchase! Grab yours today while the stocks last! 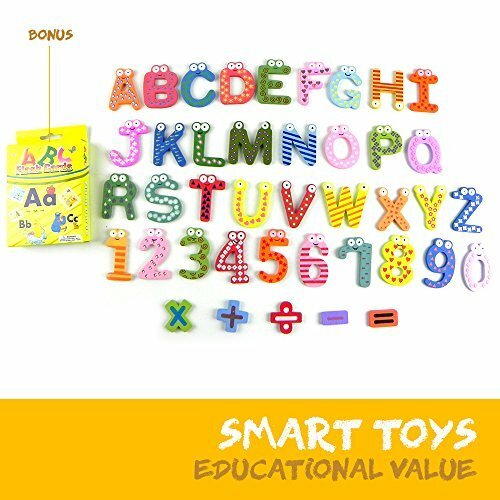 Be the first to review “Joy Abc’s Magnetic Letters and Numbers for Toddlers, Wooden ABC Toys for Educating Kids Preschool Learning Counting Spelling Games, Refrigerator Fridge Magnets Educational Toy Set with e-Book, 41 pcs” Click here to cancel reply.